Normand | Higham blog. Read articles on the law and legal issues relevant to the people living in New Hampshire. Everyday motor vehicle operators are in collisions with motorcycles. In fact, over 80,000 motorcycle operators are hurt with 4,000 deaths each year from collisions with cars. In most cases, the motor vehicle operators just did not notice the motorcycle that their eyes obviously saw. Studies show that over 40% of vehicle accidents are due to a recognition error, which includes driver’s inattention, internal and external distractions, and inadequate surveillance of the roadway. Click here to read more and request a bumper sticker! Congratulations to Attorney Maureen Higham, who was elected Selectman for the Town of Allenstown. We urge all of our friends to get involved in town government. All of us at Normand|Higham are extremely proud of Maureen. When an individual dies in an automobile accident, during surgery, or in other circumstances where another individual or entity may be at fault for their death, the law permits the family of the deceased to bring a claim for wrongful death. Wrongful death claims are governed by statute which will vary from state to state. In addition, in many states including New Hampshire, the surviving spouse of the decedent may bring their own claim for losing the comfort, society, and companionship of the deceased. Likewise, minor children of the deceased may also bring their own claims for their loss of the affection, guidance, and companionship that a parent naturally showers upon their children. Typically, wrongful death actions are initiated by the administrator of the estate of the decedent. Even if someone had established a trust during their lifetime in order to avoid the probate process, in order to pursue a wrongful death claim, the probate process becomes necessary. Since the decedent is no longer living, a family member or someone else named in the decedent’s estate planning documents must file a petition for estate administration in the probate court in order to pursue a wrongful death claim. Once established, the administrator of the estate of the deceased has all of the legal rights and obligations that the individual had during their lifetime. How much is a family’s loss worth? It depends on the facts and circumstances, but in the final analysis awards face real limits based on the availability of insurance coverage to pay the claim, the extent to which fault can be established and applicable statutory limits to recovery amounts. Explore what insurance is available, for instance uninsured motorist coverage or an umbrella policy may provide substantial resources. In order to succeed, a wrongful death claim requires proving that the death was the fault of another. Law firms frequently hire accident reconstruction or other experts to establish what happened. Similarly, the potential paying party or their insurer will hire attorneys to mount a defense. They will seek to contest liability or show that the comparative fault of the descendant or claimant supports reducing the amount awarded. Navigating the establishment of the decedent’s estate, establishing the liability of the party at fault, and pursuing court actions for the benefit of the estate, spouses, and children often benefits from the assistance of experienced counsel, especially in the aftermath of the family’s tragedy. While monetary awards can never make up for the lost family member, they can ensure that financial realities are met and help hardships be avoided. Keep in mind each state’s wrongful death statute provides for what can be claimed as damage and sometimes sets limits to that recovery. For example, under New Hampshire law, if the decedent left family, there is no limit to the estate’s claim, but the spouse’s separate claim is limited to $150,000 and each child’s separate claim is limited to $50,000. Some states also limit the recovery if the decedent did not leave dependents. When a disabled child becomes an adult, their parents can no longer make decisions for them relative to health, finances or education. A guardianship over a disabled adult child allows a parent to continue to assist an adult child in the same way they always have without interruption. The parent guardian of a disabled adult child can apply for Social Security Income (SSI) benefits as well as Medicaid benefits for that child. Guardianships over disabled adult children can be for a limited purpose and/or on a temporary basis. A disabled adult child can continue to hold many rights such as the right to vote, the right to marry, and the right to obtain a driver’s license. The rights maintained by the disabled adult child usually depend upon the degree of incapacity that the child experiences. Consult with an experienced attorney to understand the benefits and security that a guardianship can usually provide for the adult child and the entire family. Effective January 1, 2019 there is a new law that dramatically changes the way in which the Court calculates Alimony. This new law replaces earlier versions of the Alimony Statute. The new law allows the Court to award “term alimony” or “reimbursement alimony.” When considering whether term alimony is appropriate the court will consider the disparity of income between the parties such that one party is unable to meet his or her own reasonable needs taking into account the martial lifestyle of the parties. If the Court finds that an award of term alimony is appropriate the formula applied by the court is the lesser of payee’s reasonable need, or 30% of the difference between the parties gross income at the time of the order. The maximum duration of term alimony is 50% of the length of the marriage. Term alimony may be modified (up or down) if there is a substantial unforeseen change of circumstances and the modification will not cause undue hardship on either party. Reimbursement alimony is not need based. Rather, it is to compensate the payee for economic or non-economic contribution to the financial resources of the payor when there are insufficient assets available to the parties to make an adjustment through distribution of the couple’s assets. The maximum duration of reimbursement alimony is 5 years from the effective date of the decree. Reimbursement alimony is not modifiable. Alimony is an important element in any divorce one that needs careful consideration by both parties. It is important that anyone considering divorce seeks legal counsel to avoid the pitfalls that await them with the new alimony law. Nov. 6 is Election Day, Get Out and Vote! Nov. 6th is election day. Guess how many voters will turn up at the polls in New Hampshire and win a $50 gift card to Grand Slam on the Westside. First person who guesses closest to total number without going above wins. Fall Is Active Time for Deer, Be Alert! You are on your bike and a deer is in front of you on the road at dusk or dawn, do you try to swerve to avoid a collision? NO, says the experts. Swerving may likely cause bike to go down, hit a tree or guard rail or even hit the deer as it makes a last minute leap to “safety.” Stay the course. Using a horn and control brake is the best action. Deer are traveling the most during October and November. Remember, a deer is not a stationary article. What has your experience been? Robert Duffer, Chicago Tribune, reprinted Manchester Union Leader. This contest has ended. Go Sox! We have all experienced strange routes that our GPS sends us down. Once a rider was directed to a dirt road over a mountain since it was a couple of miles longer to take the beautiful paved road around the mountain. A recent driver drove up a highway exit ramp beginning to enter the high-speed highway in the wrong direction when, fortunately, only a minor collision occurred. Can the driver be relieved of liability by claiming she was following GPS? NO! All drivers have an obligation to drive in a reasonable and prudent fashion. They are obligated to follow the reasonable speed limits, and highway signs including "do not enter" signs that are located on every highway exit. Just because the person on the GPS monitor instructs you to take a left now does not mean that a driver could or should follow any directions blindly. In 2011, I was involved in a head on truck accident with a State Trooper who was going 102 mph and had crossed over the median. Even though I was the one who was hit, I was treated like a criminal at first. The accident was awful and took three years for me to recover from. I was hurt, shaken up, and having a hard time with the insurance companies. The State, my worker’s comp, my truck insurance, and my health insurance were all being a hassle. I was referred to Attorney Jim Normand, and after I met with him I could finally relax. He took over dealing with the insurance companies and let me get back to my recovery. All of his staff knew what they were doing and they helped me keep track of my treatment and calmed me down when I got frustrated with the insurance companies and their lawyers. Jim made a good deal with my worker’s comp and got the state to pay close to the limit for the car accident at mediation. This law firm cared for me. They treated me like family and told me to calm down when needed. They really delivered results. They got my worker’s comp for me, they got me a fair settlement for the truck accident and they helped my family with good advice when we were trying to get a house after the settlement. You can’t go wrong with the people at Normand|Higham. Why Do I Need SSDI Representation? A new government survey shows that having a qualified representative at your Social Security disability hearing increases your chances of receiving benefits. Can you believe it? In New Hampshire, you do not have to have a liability policy to drive an automobile. And if you do have insurance, the minimum rate in New Hampshire is $25,000. That is woefully inadequate to cover most injuries. If you are driving on a snowy day and someone is coming up behind you too quickly, fails to react to changing traffic and rear ends you, pushing you into the vehicle in front, you have actually sustained not one, not two, but maybe three or four actual impacts to your body. That generally has significant adverse effects to your neck, shoulder, and back muscles, as well as the ligaments and tendons. Whiplash is a real thing. You may be out of work for a week or two. You may have been taken to the hospital, given diagnostic testing, had your test reviewed by a radiologist, been checked out by a neurologist, or a hospital emergency room physician and other professional staff, all for which you will be billed for. That trip to the hospital may have cost $1,500 in ambulance fees and $5,000 in hospital and diagnostic specialist fees. If you are out of work for two or three weeks then that may be another $3,000 or $4,000 out of your pocket. At Normand Higham, we encourage all drivers to protect themselves, their family, and their car occupants with adequate uninsured motorist coverage. Frequently, you are able to increase your uninsured motorist coverage from $50,000 or $100,000 to at least $250,000 at modest prices, usually much less than even $100. Yes, you can have four or five times the coverage, including uninsured motorist coverage at a very low rate. Speak to your insurance agent about it. The weather today is perfect for riding. Just remember to wear your protective gear and be alert on the roads! Capt. Steve Courchesne, the esteemed and hard working fishing guide to the Normand|Higham Law Firm annual fishing retreat recently passed at too early an age. 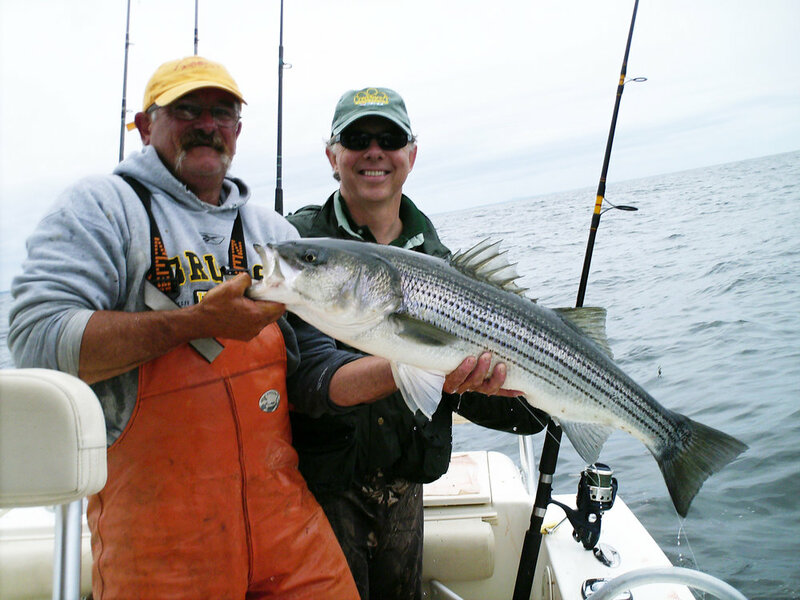 Steve taught us to enjoy and protect our environment as well as catch big fish. We are all saying a prayer for Steve and his family today. A 32 year old female motorcyclist, driving on a one way entry ramp, was killed recently when a pickup driver, in a 1997 Dodge truck, was driving the wrong way down the ramp and struck the motorcyclist head on. What options are available to her family? My first concern, as an attorney, is for the search for adequate insurance coverage to compensate for the obvious catastrophic losses that this motorcyclist and her family have sustained at the hands of the carelessness of another. The fact that the faulty driver was in a 20 year old pickup suggest that perhaps he has either none or inadequate insurance coverage. I encourage all motorcyclists to examine their own insurance policies with their agent to assure adequate uninsured and under insured coverage. That coverage steps in when the faulty driver has inadequate coverage for the harm caused. My recommendation is at least $250,000 in uninsured motorist coverage. I also recommend an umbrella policy with at least $1,000,000 uninsured motorist coverage. I frequently find that the umbrella policy usually costs only an additional $200 per year. That is great additional protection for a catastrophic loss such as this instance at modest additional cost. I ride motorcycles and am making general commentary as an interested rider. I am not commenting on this specific accident, that was reported in the NH newspapers, and wish the family of the deceased motorcyclist our condolences. Spring is upon us and riders are on the roadway. Sadly, a bicyclist was recently struck and killed while safely riding along the shoulder of the roadway. What options are available to the family? Obviously, the youthful car driver probably has primary liability, but may not have sufficient automobile liability coverage to satisfy the loss. In that event, the family would look to their own motor vehicle policies to make claim through the under-insured motorist provisions of their policy. Better still, if the family had an umbrella policy, there maybe up to another $1,000,000 in coverage available through their own umbrella policy. While this is a sad tragedy for this family, it is an important time for all of us to review our own insurance coverage. When we suffer a calamity on the roadway at the fault of another, frequently we must look at our own automobile policies for coverage through uninsured or uninsured motorist coverage. Make certain that you have enough coverage to satisfy the needs of you and your family. Be Cautious – Car accidents involving pedestrians see a sharp spike every Halloween – do not become a statistic! Make sure everyone is always looking both ways before crossing the street (hand-holding recommended but not required). Avoid Driving During Peak Trick-or-Treating Times – On the same note, play it cool for the night and stay off the road for a few hours while the little monsters roam. Pedestrian traffic and drunk-driving numbers are at an all-time high on Halloween night. Stay in Familiar Areas – Everyone knows Mrs. Robinson on the corner gives out the king-size candy bars. Set boundaries, and establish your child’s route before they leave. Arrive with Them, Leave with Them – Nobody wants to go looking for a missing Jedi in the middle of the party, so keep an eye on your friends. Keep the Tricks to a Minimum – Not everyone shares the same Halloween spirit, so don’t turn your night of fun into a night of fright. Understand the dangers of “harmless” pranks like egging, ding-dong ditching, and scaring innocent trick-or-treaters. A New Hampshire teenager recently died in the hospital two weeks after being struck by a motor vehicle in Hooksett, NH. What are her rights? What are the options to her family? First, a petition for estate administration at the probate court should be established in order to have an entity able to speak on behalf of this young teenager. Second, while the automobile insurance company for the responsible party may be speaking to the family and advising that they will take care of bills, the family should look into their own insurance policies as well. We strongly recommend that the family obtain legal advice, at least a consultation, to discuss their options and rights. That usually could be accomplished at no charge to the family. There are several sources of recovery. We would look to the liability insurance policy for the individual operating the vehicle and any other policies that this individual may have coverage under. Additionally, the teenager would be covered under her parents’ liability policy under the uninsured motorist coverage area. That would be true for both the policy for her mother and perhaps the policy for her divorced father. If the parents have joint custody, for example, then the youth may actually have two residences. In addition to medical bills, funeral, and other such expenses, the estate for the decedent is entitled to receive recovery for lost earnings in life and most importantly the loss of the enjoyment of living. An insurance claim is never a substitute for not being injured at all. But when the worst happens, make certain that the decedent received what she deserved. While the laws in most states consider our loving pets to be mere property, we know that our pets are much more than that.